A display of wall-hung art will be in Heritage’s Great Hall during April. The selections have been created by HUUC members and friends. Don’t be surprised if you notice some creative works by children, as well. Whether made by professionally trained artists or avid hobbyists, we celebrate all! Pieces which may be for sale will be clearly marked. A portion of any sale goes to the church’s operating budget. 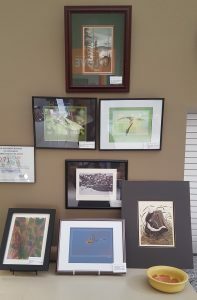 Warm appreciation goes to all contributors and to Steph Tacy for hanging the art.